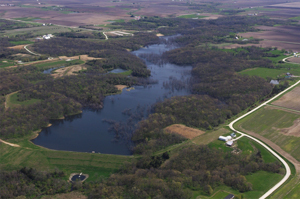 Big Hollow Dam and Recreation Area – Des Moines County, Iowa – French-Reneker-Associates, Inc.
French-Reneker-Associates designed a 56-foot tall, moderate-hazard dam for the Des Moines County Conservation Board. Our initial assignment was to update a previous design for the dam. By changing to a different outlet structure and modifying other details, we were able to save the owner hundreds of thousands of dollars. We provided coordination and assistance for the archaeological study and environmental review so that permits could be acquired for the project. This 175-acre lake is a beautiful addition to the Burlington area.